I had a moment of great vindication last night. You know how sometimes you have memories of childhood you’re not entirely sure are real? Well, there’s been one that’s bugged me for years. I was small – it was in Australia, so I would have been six at the outside, but I think smaller. And our family went with another family to a… place. Not a park, or a theme park, or a fair. Mostly I remember it as a place of surreal but not entirely unappealing terror. There was a huge totem-pole-type thing that spat water at you if you stood on a hidden panel, and (though I’m not clear on this) spoke to you in booming tones. There was a wall of strange human forms with holes in their stomachs, through which you could crawl and wriggle-climb between layered platforms. 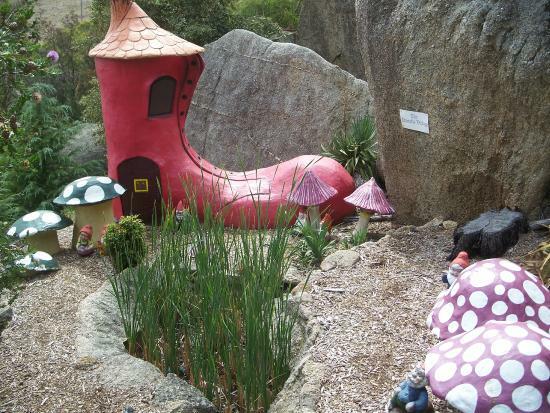 There was a strange, creepy forest walk festooned with huge, manky concrete toadstools, and you could push a button, whereupon a diorama inside the toadstool would light up and move around a bit. My memories of this place are quite vivid – I remember Mum pushing a pram around the forest walk, and running in terror from the totem-pole. But then, that doesn’t mean much – I have pretty vivid memories of hiding out terrified among lianas on Isla Sorna, while my native guides are slowly lowered down one by one behind my back on the lianas and replaced by raptors. And I’m, like, 94% certain that one’s a dream. So. Last night my excellent mother came over, and as we were mucking about on Google Maps (poor man’s tourism) I suddenly thought to ask her about my mysterious dream-park. After some cross-examination and Googling: it’s a thing. 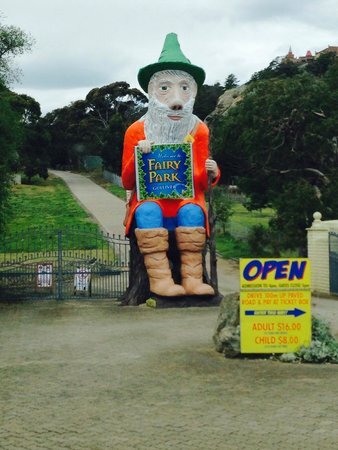 It’s called Fairy Park, it exists in the delightfully horror-movie-named town of Anakie near Geelong, and it’s worse than I remembered. Giant gnome of greeting. Don’t remember that. But OK. Guillotine! Which I’d forgotten about until now, but yes, there was totally a guillotine. Except… wait, those are stocks, aren’t they? A pillory. So why the blood? 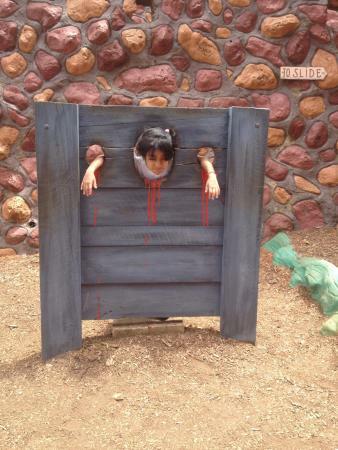 Did the park creator have a very fundamental misunderstanding of how the stocks worked? And if he did mean it to be a guillotine, why would the hands be chopped off as well as the head? That’s not… that’s never been… I have questions. 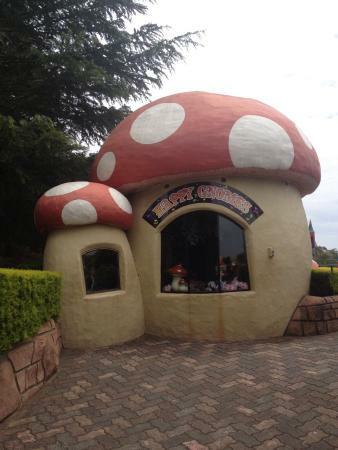 “I visited Fairy Park with grandchildren & ended up feeling that I had subjected them to an extremely damaging experience. I’m sure I don’t know what she means. This doesn’t look like bad taxidermy at all… for example. 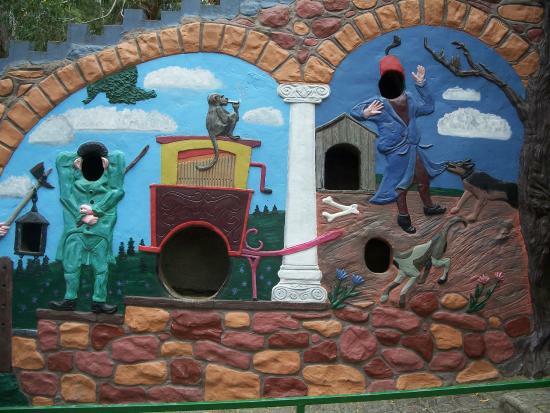 This photo is not, like most of the others, from TripAdvisor. It is from a blog, and documents a child’s visit to the park in 1988. I was two in 1988. I can only assume that by the time of our visit – say, 1990 – these Jersey Devil/hominid/hellspawn beasts had been removed from the park by order of the Children’s Rights Commission. Because those are not the sort of thing you can forget. They seemed quite fond of the monkeys. They probably grew up to be serial killers. I still get catalogues with your name on them. I miss your writing. Hopefully you stopped writing because you got so busy with your growing, wonderfully active family. I’m still out here on the net thinking about you. Late at night. Editing skills already in bed.